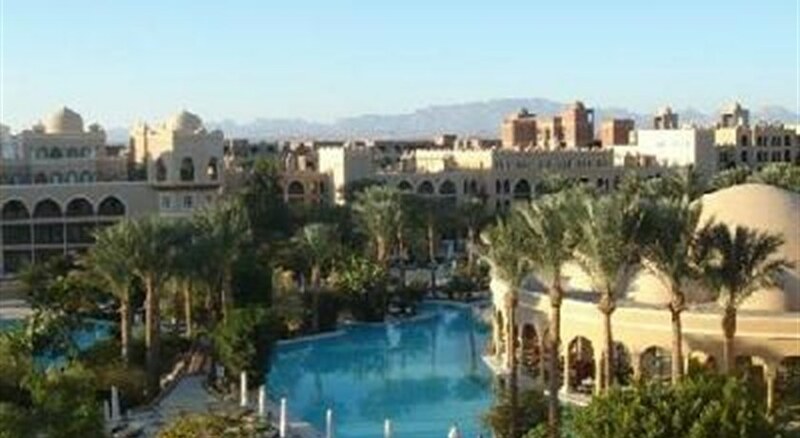 Makadi Palace is a comfortable hotel by the Red Sea in the sunny resort of Hurghada. Great views, proximity to the sandy/rocky beach and a host of guest amenities for the whole family is what makes it a tourist favourite. Excellent panoramic views of the Red Sea, palatial Moorish designs, a choice site for scuba diving and children-friendly activities at the hotel and warm hospitality of the staff make Makadi Palace the perfect place to stay during your fab Red Sea holiday. The hotel organizes entertainment programs in the evening an array of bars and restaurants indulge the guests’ palate with their delectable cuisine. Soak up the sun in style, scuba dive amidst the wonderful reefs or sip a sangria watching a tangerine sunset over the Red Sea, you will leave Makadi Palace with wonderful memories. The hotel is located next to sister hotel Grand Makadi at Makadi Bay and faces the pristine beach of Makadi Bay. It is away from the hustle and bustle of Hurghada in a charming setting. The city centre, shops and markets are located 20 to 30 km away but cabs are available. There is also a free daily shuttle to the Grand Mall, Hurghada. The nearest airport is at Hurghada 25 km away. There are 475 rooms and 36 suites spread over 5 floors. The rooms come with a balcony and terrace offering magnificent views of the Red Sea or the hotel ground. All the rooms are equipped with en suite baths/ shower, air-conditioning, telephone, TV with satellite, mini-bar, safe and hair dryer. The hotel has two buffet restaurants, Dome and Melange; which serve local and international cuisines in air conditioned comfort. There are also theme dinners during evening. A snack bar, Rendez – Vous, serves snacks all day long. There are Thai Garden and Botanical restaurants that serve a la carte dinner. Alcoholic and non-alcoholic drinks are available at the lobby bar. There are facilities for table tennis, beach volleyball, billiards and darts at the hotel. The fitness centre is has gym and aerobics sessions. Water polo and aqua aerobics can be enjoyed in the pool. For the children, the Grand Makadi has a playground and kids' club. Check-in: Check-in from 2 pm. Check-out: Check out by 12 noon.